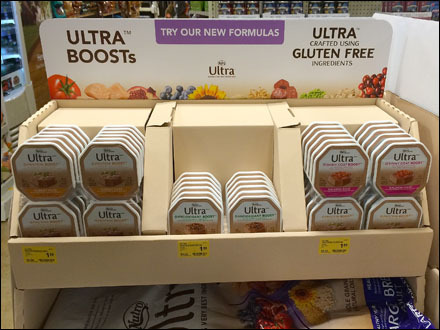 Beyond the Ultra™ Brand, the biggest takeaway from this corrugated point-of-purchase promotion is “Gluten Free” as a pet benefit. Not being up to date on Gluten and Celiac Disease warnings for pets, I must take their word for the importance of this diet offering. In this display it is deemed so, so important that even the targeted pet group is downplayed. Step through the gallery of various views and tell me at what point you can determine if this is dog, cat, fish or fowl food.